Despite the ongoing Arab riots in Judea and Samaria, the IDF is not expecting a third intifada, officials say. Despite the ongoing Arab riots in Judea and Samaria, the IDF is not expecting a third intifada (violent Arab uprising), Channel 10 News reported on Sunday. 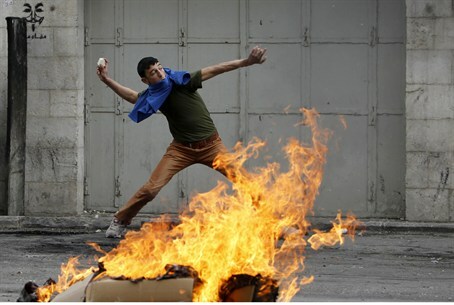 The report came as Israel's security forces faced another day of rioting throughout Judea and Samaria. The rioting has been going on for quite some time, but Arabs have used the death of a terrorist prisoner in an Israeli jail over the weekend as an excuse to initiate the latest violence. While the clashes and riots are expected to continue on Monday during the funeral of the prisoner, Arafat Jaradat, Israeli security officials believe that a third intifada is not in the works, according to Channel 10. The report cited senior IDF officials as having predicted that a third intifada is not a likely scenario because the Palestinian Authority is not interested in such a move at this time. According to these officials, the PA is not interested in escalating the situation in the region in the days prior to the visit of U.S. President Barack Obama. At the same time, noted Channel 10, the IDF’s Central Command has formulated a number of recommendations to prevent a further deterioration of the situation. Among the recommendations discussed are gestures to the PA, reinforcing points of friction with additional forces, equipping forces with additional means to disperse demonstrations, increasing training to strengthen the competence of soldiers during disturbances, and conducting briefings and refinement of the rules of engagement. One such gesture to the PA was already carried out on Sunday, as Prime Minister Binyamin Netanyahu instructed Israeli authorities to transfer the PA its tax revenues for January, "so that they won't have an excuse not to enforce calm on the ground." Israel froze the transfer of the tax revenues it collects for the PA after its Chairman Mahmoud Abbas unilaterally went to the United Nations and achieved the status of a non-member observer state. The money that was transferred on Sunday came with a message to the PA, that it should calm tensions on the ground and work to quell the riots. Meanwhile, an autopsy conducted on Sunday on the body of Jaradat found that it is impossible to determine the exact cause of his death. The autopsy, which was performed by the Institute of Forensic Medicine at Abu Kabir in the presence of a PA Arab doctor, found that no external signs of trauma were found on Jaradat’s body, and that no evidence of any disease was discovered. The Ministry of Health stated that it is impossible, therefore, to link the findings with a cause of death. Despite the inconclusive findings, the PA’s minister of prisoner affairs, Issa Qaraqaa, accused Israel of torturing Jaradat to death.